← Wake Forest Pottery Fest 2010 – Saturday September 11th! 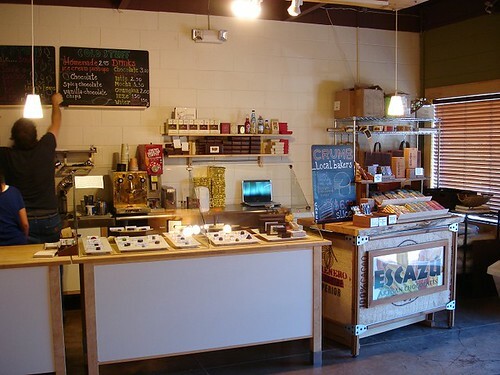 A Trip To Escazu Chocolate – Downtown Raleigh Chocolatier! Last weekend I made a trip to Escazu Chocolates at their new location on Blount Street near the Historic Mordecai Neighborhood in Downtown Raleigh (map). Escazu specializes in uniquely flavored handcrafted chocolates made from organic cocoa beans from Latin America. They are a true chocolatier in that they actually make their own chocolate right there in the shop from beans they import from Costa Rica and Venezuela. Escazu originally started out in New Bern, NC before moving to Raleigh to open a boutique store on Glenwood Avenue South back in 2007. They moved into their new location on Blount Street next door to The Market Restaurant in the spring of 2010 and have been well received by the neighborhood. It is a small little shop with a collection of wooden tables and impressive display case of their chocolates. As you relax and savor their handmade creations at one of the tables you can actually see them making chocolate in the back through a window in the front shop wall. Their chocolates resemble pieces of modern art and are almost too pretty to eat and range between $1.00 and $2.00 a piece. This may sound like a lot, but after tasting one I assure you that you will be more than happy to pay for the quality and unique flavors they serve. Regular chocolate candies found in the local drug store don’t even begin to compare with chocolate creations they produce at Escazu. They offer a wide variety of flavors and always seem to be working on inventing something new. In the past they have featured such worldly flavors as bourbon vanilla ganache, blueberry filled dark chocolates, and a balsamic vinegar white chocolate. 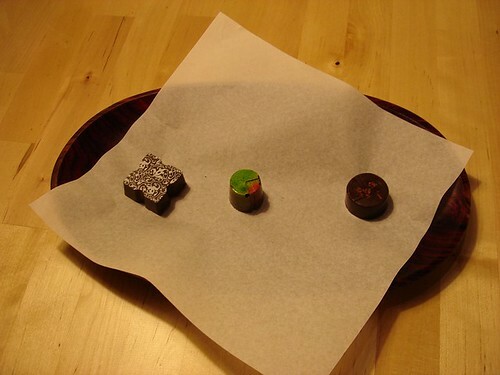 On this latest visit I sampled a dark chocolate made with goat’s milk, dark chocolate with basil, and a chocolate with chili and lime (pictured left to right in the above photo). All of them were quite excellent! The picture above is a close-up of my favorite – the dark chocolate with basil. You wouldn’t think these two flavors would go together, but they complement each other perfectly! The amazing thing about the Escazu chocolates is how satisfying they are. Instead of stuffing your face with handfuls of cheap candy that leave you feeling ill and unfulfilled, these handcrafted pieces of edible art dazzle your taste buds and fill your mouth with a flavor that is so satisfying you only need a few bites, and yet they still leave you longing for your next visit to try a new flavor. 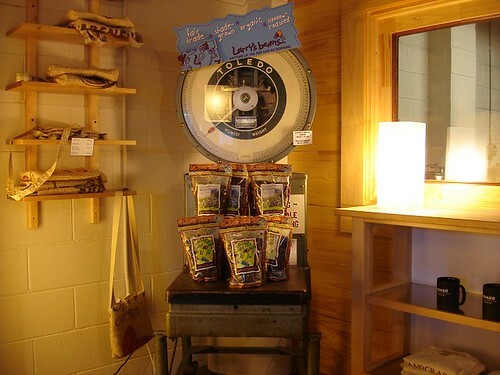 In addition to their chocolates, the folks at Escazu offer baked goods prepared by the well known local baker Crumb and serve organic coffee from Raleigh’s own Larry’s Beans. I’m sure I will be back again soon to try some new flavors, but I am also looking forward to visiting them later this winter to try some of their hot chocolate! The next time you are in the Downtown Raleigh area be sure to check out this hidden gem. Your taste buds will thank you! We were in town Saturday, and drove right past them… Won’t let THAT happen again! Nice write up. Makes me want chocolate. Mike – You must check this place out. Perfect for those with a sweet tooth. Haven’t been to The Market restaurant next door but I hear it is excellent. They keep their own bees on the roof! I JUST receieved a box of these as a gift from my clients and they are almost too pretty to eat. Note that I said almost! I tried a Chocolate Raspberrry and a Coffee; Simply delicious! So wonderful that I had to get on line immediately and learn more about Escazu and their chocolate making process! I agree Krista. They are like edible art! 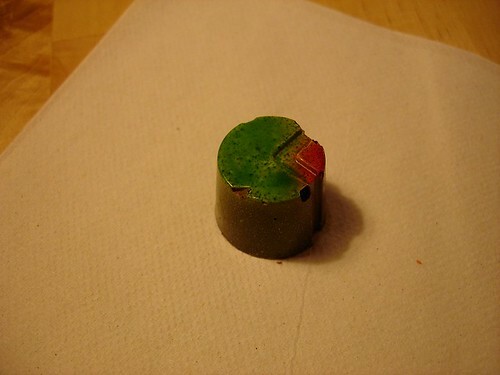 I don’t know if they have it in stock now, but in the summer they sell a dark chocolate and basil piece. They are tremendous! Thanks for the comment and stopping by my blog! What’s up, for all time i used to check webpage posts here in the early hours in the morning, because i enjoy to learn more and more.